Mbe mbe ma Yansan, May there always be a Mother of Nine, Ase. So be it. 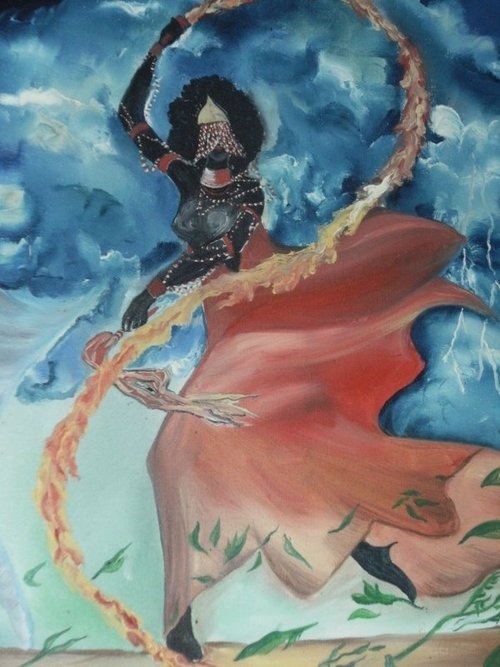 OYA is the Ruler of the Wind and Ruler of Tornadoes and She claims lightning as one of Her powers as well. O-ya means “she tore” in Yoruba. An elemental Goddess – Air, Fire Water – She incorporates all of them into Her. She is the personification of the Niger River and has the power to shapeshift into a water buffalo (and in some stories, other animals in the wilderness). As a Female Warrior, She fights ferociously and is fearless in Her protection of Her children and mates. Hunters and Chieftains seek OYA’s good graces for abundant hunting and in selecting strong leaders. OYA is also the Owner of the Marketplace. As Queen of the Dead, She safeguards the spirits of those who have passed and keeps the Ancestral connections, reminding future generations from where they came. She is the only Orisha that has a foot in Life and a foot in Death. OYA governs the gates of cemeteries and it is there that She receives offerings from Her children who those seeking Her assistance. In all that She does, She is independent, unpredictable, fierce and beautiful. To Her, I turn for transformation, purification, blowing out energy that no longer serves me. She gives voice and movement to the wild bits of my soul and when I dance and whirl with OYA, I am out of my head and intellect, fully inhabiting the elemental power of SHE. As a storm begins to gather, I feel Her energies … toiling, spinning, bubbling. I taste Her promise of rain and see Her in the streaking release of each lightning flash. She is the voice of Independent Women as well – the courage to speak our minds and the authenticity that allows us to live beholden to no man. And when She chooses, as Shakti empowers and enlivens Shiva, so does OYA empower Her mate, Chango. Reflecting the duality of Her nature (and relationship with the male Orishas), the solitary part of my nature that is very comfortable without a relationship with a man is a part that I truly identify with OYA. This article gives me an opportunity to share some of the story that led me to honoring the Orishas and developing a relationship with OYA and the Orishas. Orisha is the generic Yoruban word for “god”. Many of the Orishas were regional deities who traveled with the slaves to the Caribbean and sparked the variations of Afro-Caribbean worship. Yoruba tradition says that before souls are born, they choose an Orisha for their human life. A portion of that Orisha’s cosmic essence lives in the human’s head and that is where the phrase “owning a head” comes from. Sons and Daughters of particular Orishas also tend to embody some of the characteristics of the Orisha. For those who are interested in approaching the Orishas and/or are attracted to the African Yoruba practices, I encourage you to do your research. 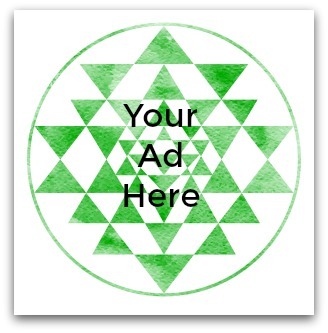 We all carry within us ties to areas of the world and connections to deity that transcend our current place, time, genetic roots and outer rationale. These urges, spiritual “wonderings” or instincts of connection do not always seem explainable to the outsider but they could be a missing piece to your spiritual puzzle. 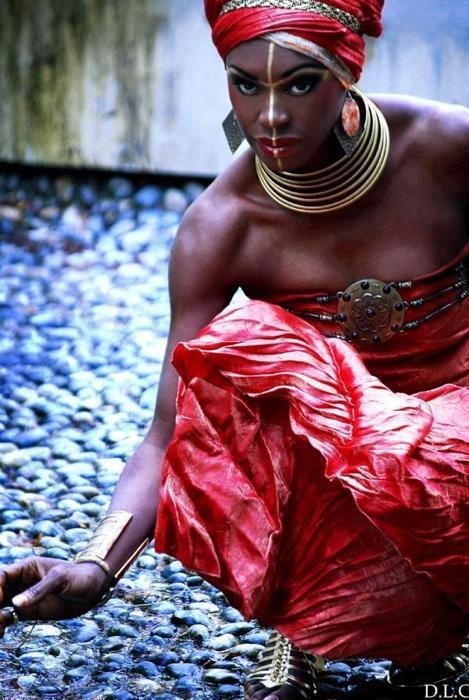 As a blonde-haired, green-eyed woman of Irish and German heritage, it seems completely unlikely that I would have a strong connection with the African Orishas. But I do and it is one that has been confirmed repeatedly, even to my own surprise in many cases. I love the Orishas, their energies and their stories. 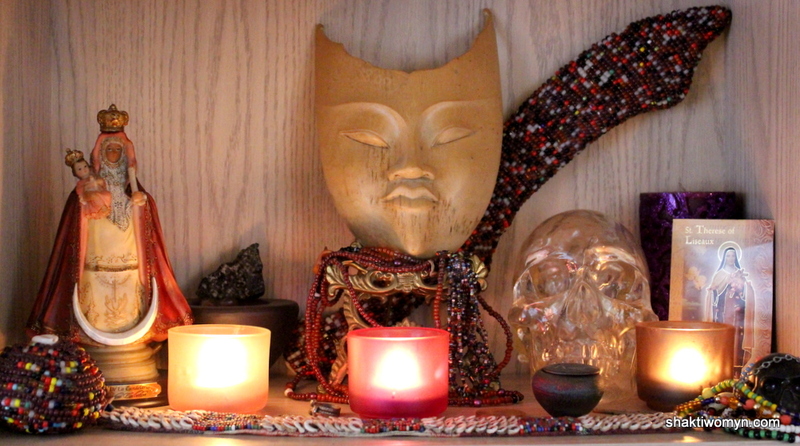 I have several altars in my home to them – Eleggua sits right by the front door on his favorite red trunk surrounded by toys, candy, rum and cigar. Obatala likes to be on top of the bookshelf – a serene presence that I reach out to like a touchstone. And, of course, there is OYA … copper coins, Her beaded weapons, skull and other offerings that She has claimed through the years. As a non-Initiate, I approach the Orishas a bit differently than can be called traditional or accepted practice. I have considered initiation but it is a commitment that requires thoughtfulness and guidance from the Orishas. For now, I offer the Orishas a devotional relationship because I felt the deep ties and want to honor them. My journey to the Orishas began in my early 20s when I moved to South Florida. 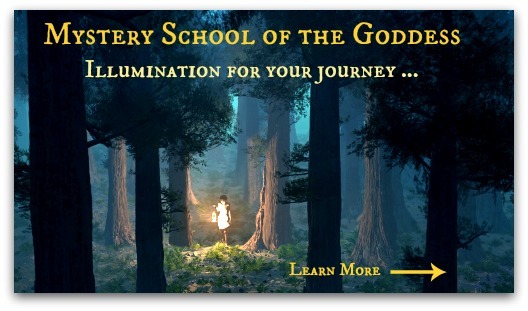 I was so blessed to connect with a vibrant spiritual community that included practitioners from various magickal and spiritual traditions and lineages. The Afro-Caribbean current is strong here in South Florida with the incredible communities of immigrants from Cuba, Haiti, Brazil – all hotspots for Santeria, Vodoun, Lucumi and Candomble and Orisha worship. Botanicas (stores for spiritual supplies and consultation) are very present and have survived Internet buying where many brick and mortar metaphysical stores have not. From the moment that I arrived in Florida, there was always a low drumbeat on the edges of my perception. I did not fully identify what it was until I had an opportunity to attend an Egungun Ceremony. A local business owner and friend had suffered a tragic loss of both of his parents in a car accident. His elevation to formal head of the family was being marked by the Egungun ceremony to which I was invited with some of my spiritual teachers. A Priest, drummers, dancers, and ritualists were all flown in from Nigeria to perform the ritual. When the drums began to beat, I was mesmerized. The only thing that I can compare it to is the rising of the kundalini. Each beat seemed to resonate with something in my body … spirit … soul. 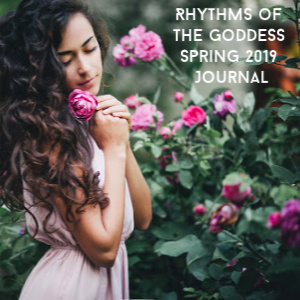 I struggled to stay fully seated in my body when all I wanted to do was get into that ritual space and dance, and allow my body to express the internal and external rhythms of the drums. Swaying, rocking, I was fixated on the colorful, wild ceremony unfolding before me … I found myself on the edge of the ritual area without even realizing it. Names that meant nothing to me at the time filled my brain – Damballah … Oya … the intensely beautiful singing of the orikis filled me. I was “home” without even realizing where “home” was. At one point, the Priest rose and began reading all the names of the Ancestors on both sides of the family as far back as they had been traced. There were prayers, invocations and sacrifices. It was one of the most fascinating days of my life, and I can still see the whirling colors vividly and feel the evoked energies even though it has been twenty years. The Egungun ceremonies commemorate and recognize the ancestral spirits – they are OYA in all Her wild, beautiful power in masquerade and as the Orisha of the Dead and the Ancestors. The drummers, dancers and singers tell stories of praise and names (orikis) through movement and rhythm and through their costumes. Elaborate masks and fabrics of every color imaginable are on display by the ritual participants and the attendees. That Egungun ceremony was my first introduction to the Orishas and to OYA in particular. I have had a strong connection to the dead since childhood, and my most powerful Goddess connections have always been with the Dark Mothers that hold sway over the dead and liminal areas. Looking back, it was almost inevitable I would be so drawn t0 OYA . With a flash of Her colorful skirts, She had whirled into my life. In the years since the Egungun ceremony, OYA has made Her presence known in multiple synchronicities. I have been so lucky to have access to Santeros and Santeras who have encouraged me in my devotion, consulted for me on how to approach the Orishas and guided me in a very non-traditional practice. 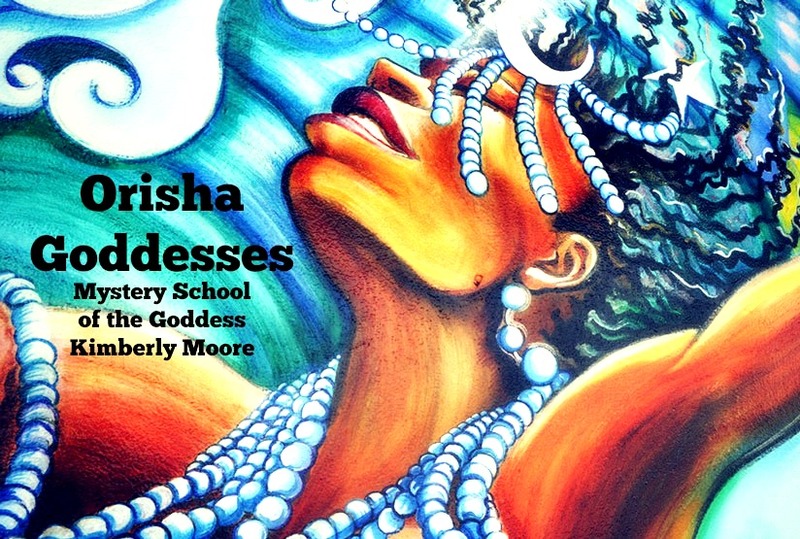 My devotional approach to the Orishas works for me and for them – we have come to an understanding of our Worship Bargain. One synchronicity came out of the blue. While working for a hospital, one of the women I worked with happened to overhear me say that I was going to meet a friend at a Botanica after work. She approached me and asked if I was initiated. I replied that I was not. She told me about her mother who had passed the year before and had been a Santera in the community. As we spoke, the energy between us began to increase until it was electric. The hairs on both of our arms were standing straight up. She asked me if I knew who the Orisha of my head was, and I told her I thought it was OYA but had not had it confirmed. She broke out in a huge smile and said that her mom was also a Daughter of OYA. The next day, she brought me a ring that had belonged to her Mom. I was so shocked and delighted. She had kept the ring because she always felt like it was supposed to go to someone. For the next several weeks, I dreamt of the Santera and she gave me messages to give to her daughter. It was incredible. OYA – the Goddess who mediates between the world of the living and the dead had brought about a connection to deliver an important message from one world to the next. How amazing are the Goddesses?? A few years ago, I connected with a female Priest of Chango. She came to visit me and over several days, we walked the swampy areas near my home as she pointed out the plants sacred to OYA. She also taught me some of the beginning steps of beading. Before her visit was over, I gathered herbs and other offerings to create an Osain for OYA, and then beaded it myself. 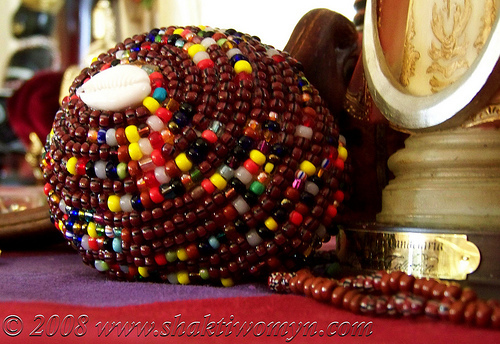 I was delighted to be able to create this sacred vessel as a symbol of my love and respect for OYA, and it still sits on Her altar. Below is my completed Osain. OYA and all of the Orishas are strongly with me always, even when I have not lived in South Florida. When I was in Utah and a storm would gather over the Wasatch, I could see Her dancing the winds down the mountains and hear Her big belly laughs of delight in the pure, raw energy. There are so many more layers to OYA. Her sacred number is 9 – nine skirts – Yansan. 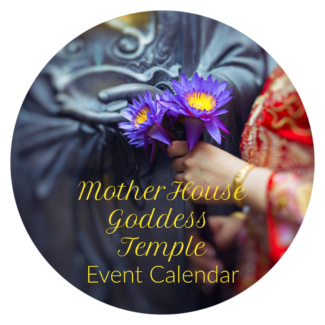 Some of Her favorite foods that are also good for offerings are eggplants, yams, red wine, chocolate pudding, black grapes, figs and star fruit. She syncretizes to La Candelaria (Our Lady of Candlemas) and Santa Teresita in Catholicism. Friday is Her day of the week and Her colors are burgundy and purple. Copper is Her favorite metal. The Orishas are available to all who wish to connect with them, but it is also wise to remember that with all deities, you should do your research as well as follow your instincts. Read about them, meditate with them, dream with them! As I was working on this article, I had several nights of dreamtime with OYA and some of the other Orishas. Whizzing through the air, the sound of wind rushing my ears, I tasted and joined with the power of OYA. We mirrored warrior stances and were delighted at the prospect of battle. I saw our connection that had been forged over multiple lifetimes. **in the time since the writing of this article, I have completed several initiations in Lukumi. Imagine my surprise when it was confirmed that OSHUN was the Guardian Orisha of my head. I will say surprise and delight since Oya and Oshun share a strong bond and I am blessed by all of the Orishas. Maferefun Oya! Maferefun Oshun! Ashe! OYA: In Praise of an African Goddess by Judith Gleason. This is a magnificent treatise on Oya. Hmmm!!! This is really interesting. Recently, i saw myself dressed in an unusual way which drew my attention to the fact that i need to knw what that dream meant. Seeing myself dressed like Oya in my dream was a bit confusing… Her attributes are indeed in many ways attached to me one way or d other. I guess i have something to do with her… Bt i think i need to do more research so as to b sure. I am a child of OYA and one of the first dreams I had confirming she was my guardian Orisha was being dressed completely like her with my brother on my. Side dressed like shango which he is an initiate too. It confirmed she is my mother. OYA is very particular in choosing her children only a selected few are chosen. The article was very informative. I’m a lucumi priest who has chango crowned and oya is my mother,and the transformation that has happened in my life i can’t stop from praising her.Ache! Continue to teach.maferfun oya everyday. Love your mission. May my Mother Oya bless you in health and abundance. Ase Oo. Maferefun Oya! this article is beautiful. I was wondering if you ever dreamed of Her and how was it? I know that She is my Iya but never spoke to no one about it. It is also difficult to find the right people to guide us when we need it the most. Your page is amazing, please keep up the excellent work. ASHE! Thank you, Acialuz for your comments! I do dream of Her 🙂 – perhaps spend some time in prayer and ask Her to come to you that way? Make a devotional offering to Her! I too have loved the Orishas since learning a little of the drum songs many years ago. Really music wise that is all I want to do-play and sing praise songs. Last week I was at a ceremony and came home and built a beautiful shrine to Oya-my house now feels so safe and comfortable. I hope she will bring me to her songs. speaking as someone who is an admirer of Lady Oshun, ashé! what a beautiful and personal meditation on our mother of nine. praise her righteous might! thank you for this comprehensive post. What a beautiful account of the development of your relationship with Oya! I too live in South Florida and feel her presence from time to time. I refer to her as Goya – the Winds of Change. My connection to her is deepening as I reclaim and integrate my womanity after 20 years in a male dominated occupation. 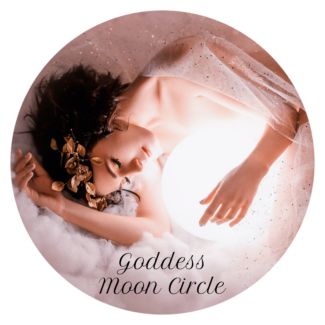 I can’t wait for the Full Moon gathering – praying that my job enables me to finally be home and ready to experience this next step in my ultimate transformation. Blessings! Thank you for the beautiful insight…. So many questions. To sum it all up since 2005 I was told by a random woman on the bus that I was the daughter of the wind that to always know I was being watched over….smiled and said thank you. Here we are in 2016 and still have those random moments when I feel the wind and feel like someone is with me. I would love to know more to better understand what it is to be a child of Oya!! A few months ago I asked the Univese to help me find which Orisha was my Ori. I had to relocate and was not able to make an alter where i was visiting, however I asked that the Goddesses understand and please show me that they are still connected to me. Upon settling in I had a strong desire to buy copper jewelry..which i never liked before.i also was drawn to Starfruit and Red wine which I never was before. And to add that I’m in Ga where thunderstorms are quite fierce and frequent I find them delightful and powerful. After reading your article it all clicked ! I was being lead to my answer. My character and behavior aligns as a daughter of the beautiful and powerful Oya. Now I will seek affirmation and continue my life’s journey. Thank you for this information. I know I was directed here for answers. I had a dream awhile back and i believe it was Oya but i am not sure. I am from New Orleans and we were in the French Market. She was tall, i came up to her waist. But she was not wearing any colors. Only a brown belt with one of her dread locks hanging from it. Any way, she told me not to be afraid, but i was and i ran. When i turned to look back, there was a look of disappointment on her face but also as if she already knew i would run. Since then, ive collected pennies in a vase and have a candle. But want to connect better. Have you crowned since this article. I am a crown Oya. Still an Iyawo but I would love to join your school. I too practice eclectic and took a long time considering crowning but did it. Is Oya a form of Lilith. .
That was beautiful to read. 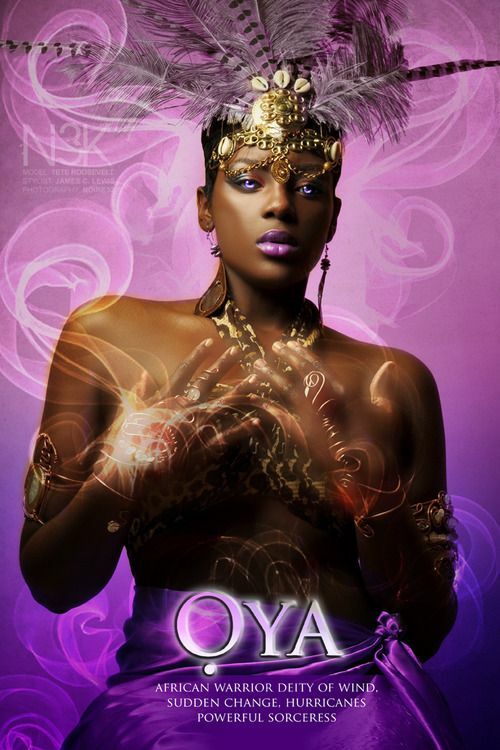 I found out I was Oya but then later found out Oshun as well. I was kind of confused. Can you really have multiple Orishas ? I AM happy to be an aleyo, a non-initiated devotee of the Orishas. There is a book I saw several years ago; alas, I do not recall the title, offhand, but it listed bullet points for all the Orishas, as if to answer indicate if one has a strong affinity with that particular Orisha. I was able to check off all but one bullet point for the chapter on Oshun, and all but a few bullet points for the chapter on Shango. When I feel led to call upon the Deities of my Secondary Pantheon, I have learned to call upon Elleggua first, then call upon Oshun and Shango. Then, if necessary, any others. Regardless, I have always had a reverence for Oya, and have always loved saying Her Name; I do not fear Her, for I know She Is the power of transformative change. HI Jaquita! 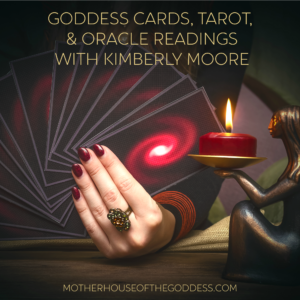 Please feel free to email me kimberly@motherhouseofthegoddess.com – THANK YOU! Nice story..i love. Sorry for mi English, i’m from Italy. I’m proud to be Oya’s daughter, i find out in Kofa of Orula, but i always knew i was her daughter, i will crown her this August. I love my Iya, i fell blessed to be chosen by her. Marefefun Yansa. Ase! And SO many blessings to you and OYA! I crown Oya last June. Peace and blessings, light and energy. We are here.